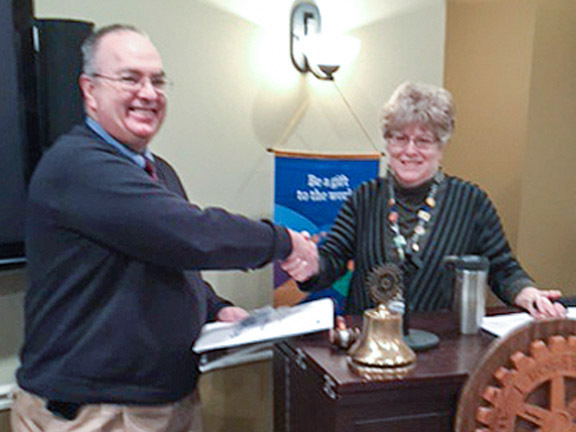 Rotary File for February 2, 2016 | Rotary Club of Iowa City A.M. 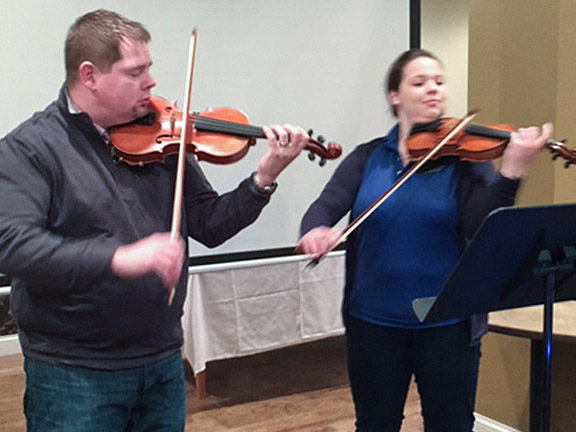 The February 2 meeting featured a presentation by John Schultz about the history of the violin, or "400 Years of History in 20 Minutes or Less." He and Lara Celeghin also started out by playing a violin duet. We celebrated a large number of February birthdays. Myrene Hoover reminded us that it was groundhog day. She recalls catching a groundhog one time and remembers that it was heavy and very smelly. In the world of Rotary February is World Understanding Month. Take a look at the February issue of "The Rotarian" for an interesting article on Peace Scholar experiences. Joan Garrity reminded members to sign the sheet going around to attend the Feb 23 evening meeting to celebrate our community grant recipients at 6:30 in the Kirkwood Room. Please pay $25 per person in advance. We celebrated the induction of Phil Jordan into the Club. Phil is the Business Liaison working at the Henry B. Tippie College of Business - University of Iowa. Phil is a past Rotarian who is very happy to be back involved with Rotary. His sponsor is Deb Dunkhase. Myrene Hoover indicated that we will be devising a number of fundraisers this year and in the future to help make up for the losses our budget has sustained from the loss of can revenue from City Carton. In the past we could count on $7,500 to $12,000 per year in recycling income. In the past month the total coming in from the Can Shed was $95. Mark Patton announced that he will be forming a committee to work on a miniature golf fundraiser at Colonial Lanes. We raised over $700 with our Mellow Mushroom trivia event. Nan Johnson is collecting books for the Shelter House book sale. She will also collect on February 16. The sale will be March 5-7. Mike Messier reminded members that the Community Foundation golf event will be May 23. Put the date on your calendar and plan to volunteer to work or to golf. The Iowa MOST team will be leaving for the highlands of Guatemala on Feb. 4. We have several members who are on the team. Chris Knapp has returned from the International Assembly of all the incoming district governors from around the world. The 2016-17 International President Elect is John Germ and his theme will be "Rotary Serving Humanity." Please plan now to attend the conference. It will be in Atlanta June 10-14, 2017. It is fitting that Atlanta be our 2017 conference location because the Rotary Foundation was started in 1917 at the first Atlanta RI Convention. Frank Juvan introduced the program for Feb 2 and John Schultz. John and Lara Celeghin began the presentation by playing a Telemann violin duet in D Major which was a lovely way to start a discussion about the violin. String instruments began thousands of years ago in Egypt, India and in China. The invention of the modern violin began in Italy with the gamba in the 15th century. The part of Italy that our exchange student Lara is from, NE Italy, is where Gasparo da Salo (1542-1609) converted the viola da gamba into the modern violin. His pupil, Paulo Maggini continued the violin-making tradition. Nicolò Amati (1596–1684) and Antonio Stradivari (1644–1737) became perhaps the most well-known violin makers and solidified the dominance of the Cremona area of Italy for making quality violins. Stradivari was particularly prolific making over his long life about 1200 instruments including 900 violins. Other countries have quality violin makers. There are good examples of violins from France, Germany, England and the United States as well as Italy. Schultz indicated that the "starter" level for an investment quality violin is $20,000. Fine violins appreciate as investments more rapidly than most other investment vehicles. Stradivarius and other early fine quality violins are auctioned for $600,000 to several million. Fine quality bows can cost $7000 and up to $1,000,000.